The floats were jerked left and right and spun around. At 7:00 p.m., the taiko drum-beating started and the floats left the starting point one by one. 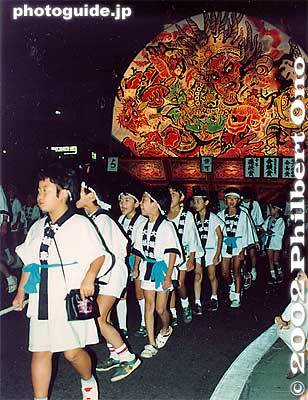 The beat of the taiko drums was the same as that in the Nebuta Matsuri. A few men stood on the top of the large Neputa and collapsed the hinged, top portion to clear overhead power lines. The floats were jerked left and right and spun around.